War Reports From the Deloro "Once-A-Week"
From Pte. W.T. Gray, 49th Highlanders, somewhere in Italy, February 7th, 1944. “How the time seems to go by over here. We lose track of what day it is so easily that a week has gone by before we realize and no letters have been written. I received 300 cigs while I was up at the front. They just arrived at the right time although our issue of cigs from the regiment is very good. I am in Italy and have been up to the front. Some of the boys have started receiving their parcels so mine should be along anytime now. It takes so long and the parcels get such rough usage that I think it best not to send anymore, just cigarettes. C.H. Buskard and H.A. McNally are new members recently elected to the Board. At a meeting this week $1,000.00 was granted the Red Cross and 300 cigarettes were sent to each local man overseas. 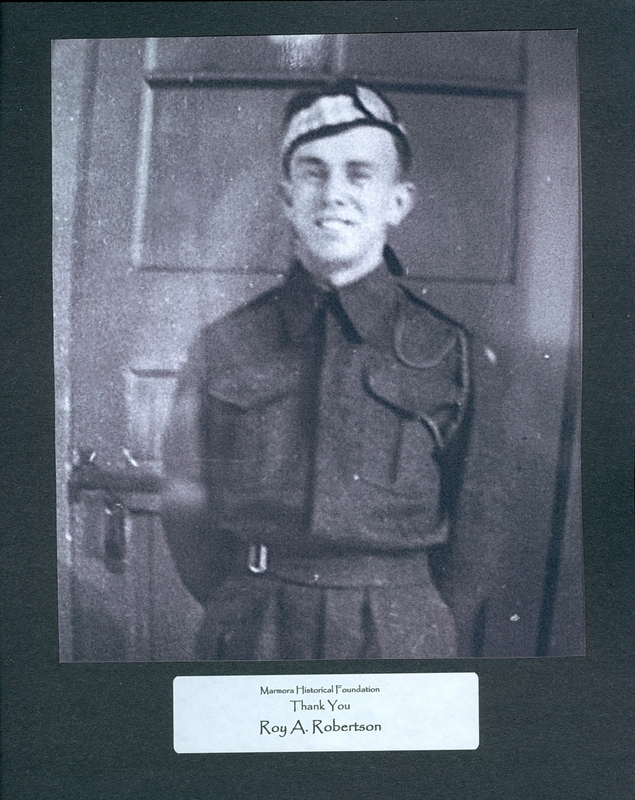 “Ken Regan was discharged from Military Hospital on Monday and has re-joined his unit in Hamilton. From Cpl. Lois Buskard, Somewhere in England, November22, 1944. “Last night we got the scare of our lives and I ain’t kidding! One of these V2s landed a short distance from our place and we really felt the effects of the explosion. It knocked the plaster off the walls and several things off the mantle, and gave the old house a shaking including us. For a minute we all thought we had it after it was all over, we forgot about it and went about our business. These darn Germans are sure trying to get us but they will never succeed. Personally I don’t like either Buzz Bombs or those Rocket Bombs but if I had my choice, I would take Buzz Bombs. At least you can hear them coming; with the Rocket, you can’t. You just hear the explosion and haven’t a chance in the world if they hit. But don’t worry about it because I’m a lucky person. Just note it as one of my experiences of this war. Reported Missing - A general feeling of optimism throughout the entire Plant is shared for the safety of Lieut. Percy Gray and Sgt. Tom Maloney, former employee of the Stelllite Department, who have recently been reported missing in action. Oxide News by G.M. - “Well General Divisioners this our first column since the era of peace has settled upon us and whether we are entering a highly mechanized era or an atomic era, so long as the forces of War remain in the background we are sure, through the lesson we have learned, to see things we never dreamed of now that the lights are on again. Remembrance Day Service in Deloro was held in the Deloro Community Hall and being attendance by the Legion Members, the people of Deloro, having both Public and Separate Schools marching to the Hall en masse in order to attend. Short movies were shown for education purposes, wreaths were laid in remembrance, after which Reveille and Last Post were sounded by George Charles Brooks. Coming Events - A Dance will be held in Marmora Town Hall on April 14th under the auspices of Marmora L.O.L. 319. Music will be provide by Jones’ Orchestra, admissions 75 cents per couple and extra ladies 50 cents. Tickets will be drawn for War Savings Certificate. From Private J. A. Izzard, H. & P. Regt., Somewhere in Italy, February 19, 1945. “I moved again and serving with the good old Hasty Ps. I like the Regt and all the boys, I have met quite a number of lads from around Peterboro, Cambellford and other places. I see Bob Scott every day and stop and chat with him. He recognized me first He is a captain now. I’m up at the front. That’s how I came to meet him.. I’m taking an anti-tank course and if I pass I’ll be in Bob’s platoon. I met a fellow last night that is related to Art Reynolds. Art Reynolds’ sister is this chap’s mother. I also met a lad from Trenton, his name is Sam Trumble. Orville is his uncle. Deloro News - “Peter Brawley informed us that his son “Pat” is a member of the crew of the now Canadian Cruiser “Uganda” and that they travelled a distance of 22,000 miles before reaching port in Australia. The crew of 900 were given a great welcome when they reached port, the ladies of Australia presenter each member of the crew with a Ditty Bag. Thank You Cards - Thank you cards of appreciation for cigarettes were received in Dec. from the following: Pte. M. Dostanko, R.E. Langley, Tpr. L. Hoover, Sgt. P.A. Bell, Flt. Sgt. W,D. Bonter, Pte. R.A. Robertson, Cpl. L. Forestell, C.S. Reynolds, Kelvin Cummings, J.P. Brawley, G. Devolin, C.H. Bedore, Lt. N/S Teresa Shannon and Cp. Lois Buskard. The Village turned out in force to receive Lt. Percy Gray on his return from Overseas, and the cries of “Welcome Home” were spoken from the hearts of all who knew him. The reception was entirely spontaneous and while all were sincere in doing honor to Percy, it was really a symbol of the welcome the people would like to give to all their returning heroes if the exact time of their arrival could be known as definitely as in this instance. The Deloro Wolf Cub Pack acted as the guard of Honor and led the parade from the school grounds to the home of Mr. and Mrs. Floyd Gray, Percy’s parents. Sto. John Shannon, R.C.N.V.R. ; N/S Hilda Mumby; Sto. P. Brawley; Cpl. C.S. Reynolds; Pte. C.B. Bedore; Grn. N.D. Sopha; Lt. L.A. Paquet and A.J. Kouri. Winnifred Kathleen Mary Brooks, C.W.A.C. Deloro News - It looks as if we have lost another telephone operator as Winnie Brooks was seen in uniform over the weekend. Deloro War Fund - Letters of appreciation for cigarettes received from the Deloro War Fund were written this month by the following local boys overseas:---Roy Robertson, G.R. Osborne, Gordon Devolin, MJ. Cummings, J.L. Forestell, Orville Peck, Jim Loveless, R. Booth, Mac Bonter, W.J. Richardson, E.R. Vincent. “THANK YOU FOR STAYING ON THE JOB. In the History Books of the future, Monday, May 7th, will be recorded as the day the Germans surrendered unconditionally to the Allies. In the records of this Company, it will go down as the day that practically all the employees stayed on the job to get out production necessary for the continuation of the fight against Japan. The Honourable Mr. Illsley, had a few days previous, asked Canadian workers to stay on the job when V-E Day was announced. He said a common enemy remained to be beaten and that any production losses as a result of the V-E Day Announcement would hinder our efforts against the Japs. The day after the official announcement, Mr Ilsley advised, would be observed as a National Holiday.